Although Degas did paint some landscapes, he was known to have thought the subject minor, choosing instead to study the gestures and poses of human figures in interior settings. 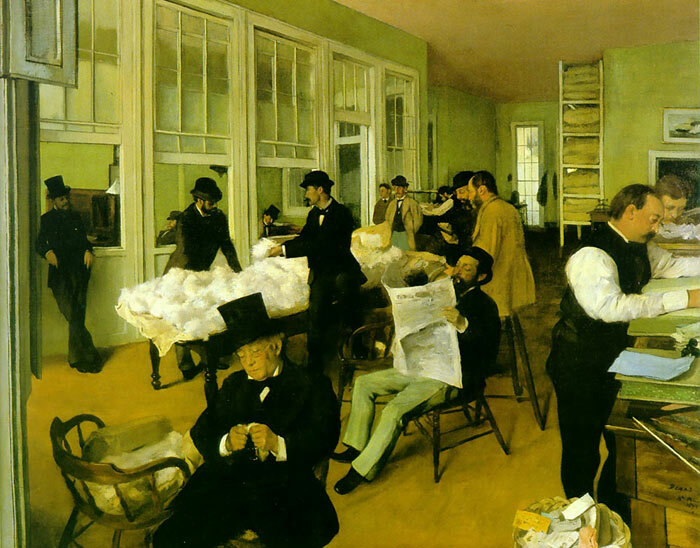 Degas paintings are actually closer to that of Édouard Manet (considered a Realist by art historians rather than an Impressionist), who also depicted ordinary people in contemporary dress or (undress). Degas's portraits share with Manet's an interest in the complexity of human expressions and the articulation of everyday experience. SPECIAL NOTE : The painter will make the reproduction as close to the original oil painting as possible. If you want your painting to alter from this likeness, please email us and " Portrait in a New Orleans Cotton Office, 1873 " will be reproduced according to your special requirements.